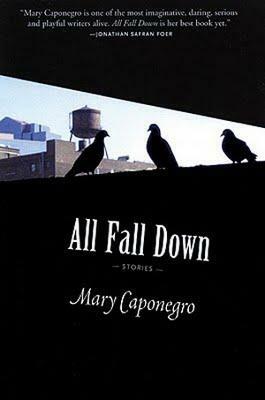 The topical variety of the stories contained in Mary Caponegro’s All Fall Down is close to astounding. Her protagonists are women, men, and children. Her stories consider poesy, abortion, marriage, chronic illness, terrorism, pregnancy, lesbianism, and international travel—all with grace and interest and without a hitch. The sheer unpredictability of her subject matter adds excitement to the reading of her new collection: the previous story has no bearing on the next and tends, in fact, to make its plot even more startling than they would already be. Occasionally, though, the plotlines are so bizarre that they would stand out in any collection. This is the case with the extraordinarily intriguing, though not entirely successful, “Junior Achievement,” in which the young children of murdered abortionists attempt to take over their parents’ practice. In All Fall Down, very few practical links exist between a character in one story and in another, which is a substantive asset in a writer of short stories. In tone, however, the stories in All Fall Down are almost infuriatingly uniform. Caponegro’s voice as a writer is intensely verbose, dramatic, and literary, and she varies little from tale to tale or character to character, with the notable exception of “Junior Achievement,” a surreal story told almost entirely in dialogue. The uniformity is particularly noticeable in “Ill-Timed,” in which both over-educated athlete Alex and her wry, awkward lover Paula speak and think in a manner exaggeratedly articulate, stylized, and uniform. Ultimately, it does Caponegro’s final story, “The Translator,” a great disservice, as its narrator’s high-minded, poetic turns of phrase would likely stand out more for their artistry in a collection not so steeped in overly dramatic prose. Caponegro is clearly an original and fascinating thinker. In several of the stories, the specificity of her characterizations overrides the annoyance one often feels at a piece attempting to cover too many issues. This feat is particularly notable in the stories “Ashes Ashes We All Fall Down” and “Ill-Timed.” However, Caponegro has not yet made the final link between her prose style and her style of thought. Unable to vary the one according to the fluctuations in the other, this oversight often made it difficult to focus on the emotional content—and power—of her work.